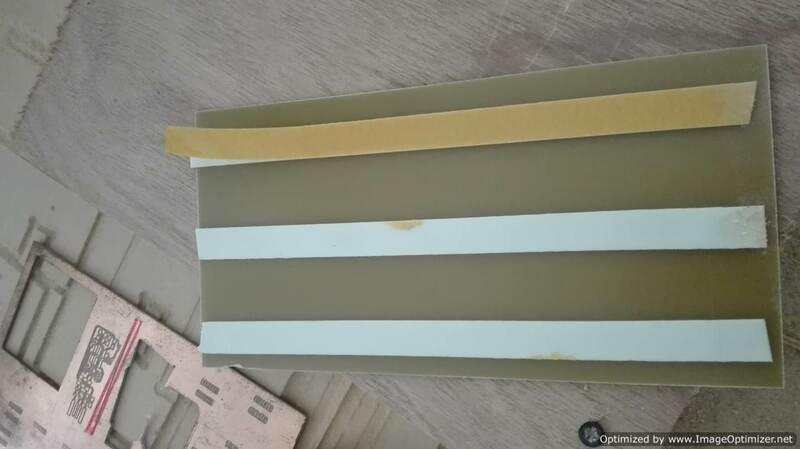 In my country there are 2 types of board 1 normal and another fiberglass. 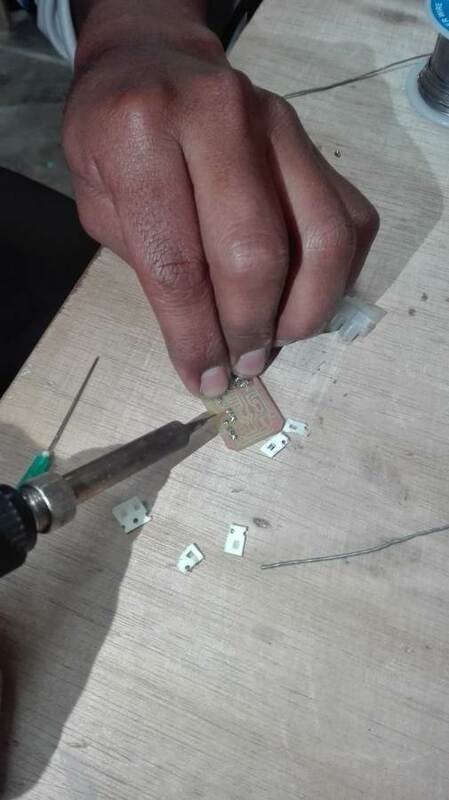 To place the copper board on the platform of the machine we use a double-sided tape. 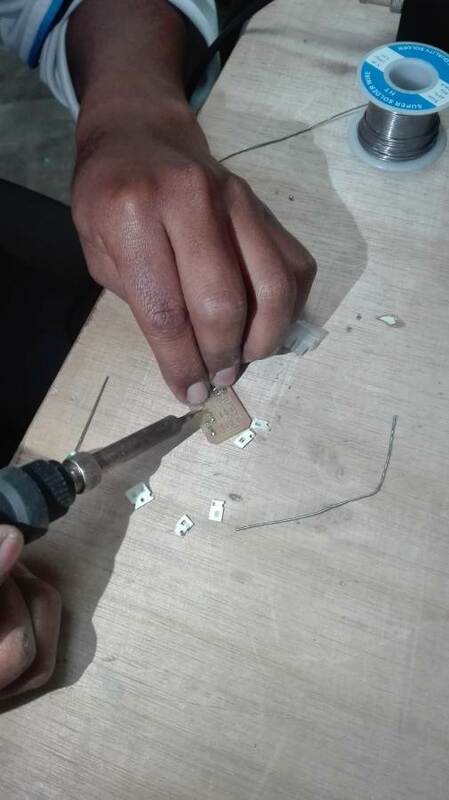 During our first practice, we learned how to change the cutting tool and the location at the zero point of work. 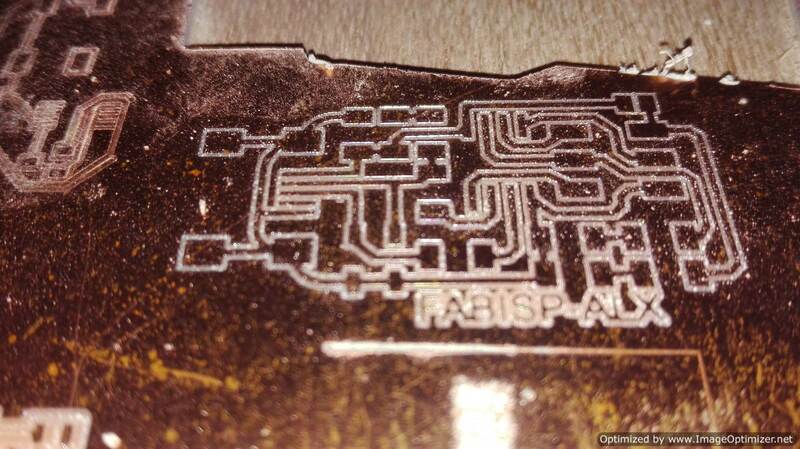 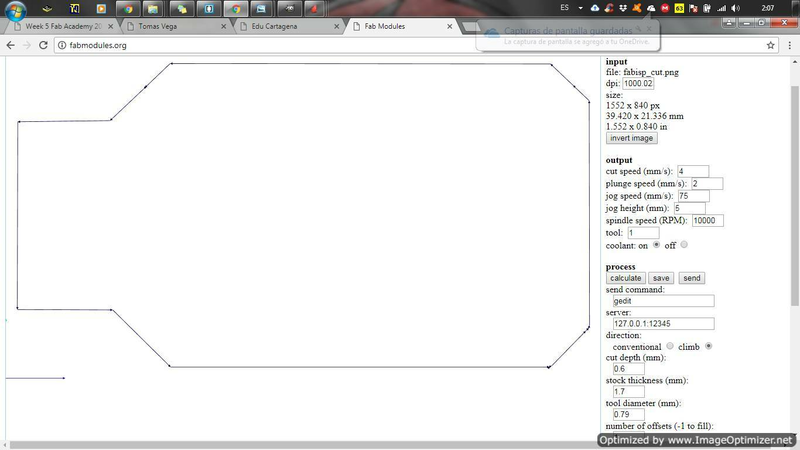 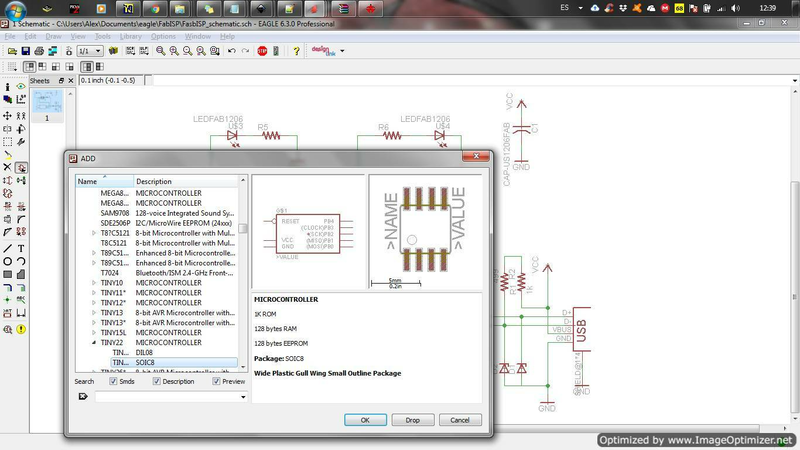 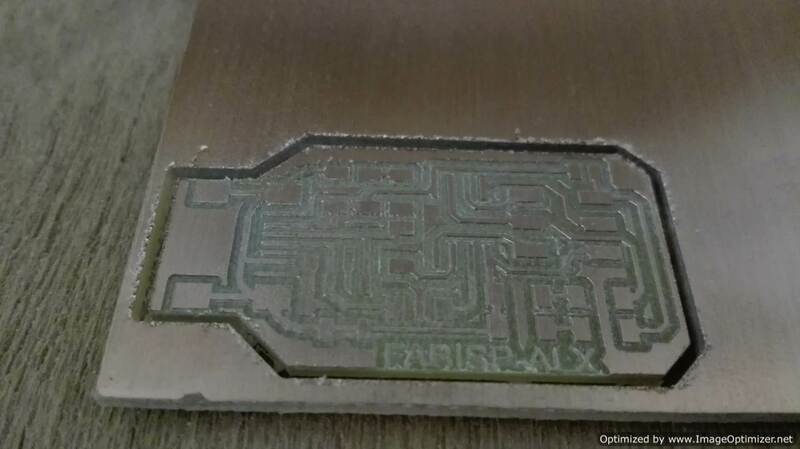 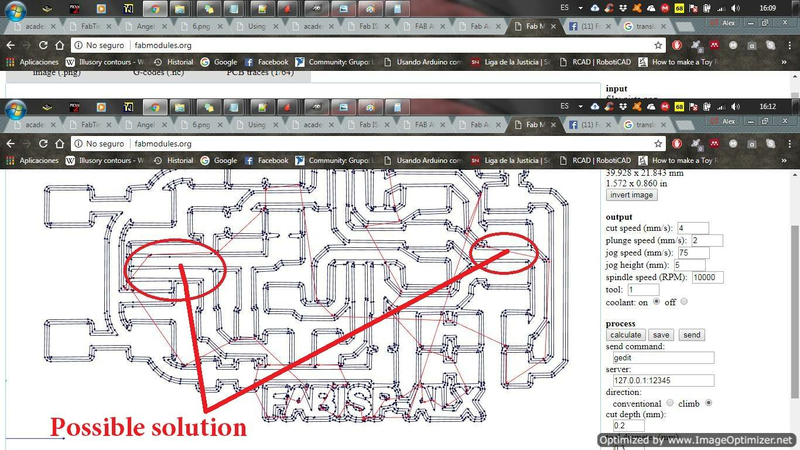 In this practice, we learned how to configure the traces and cuts of the pcb on the FabModules page. 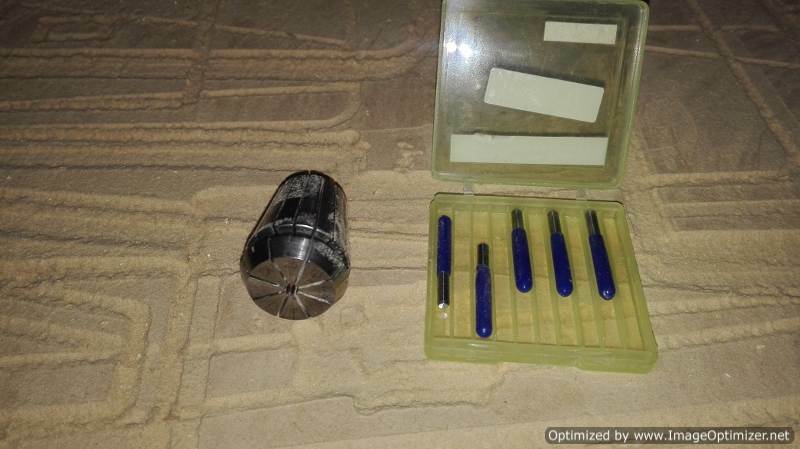 The milling tools my laboratory has are 1/64, 1/32 and 0.01 mm. 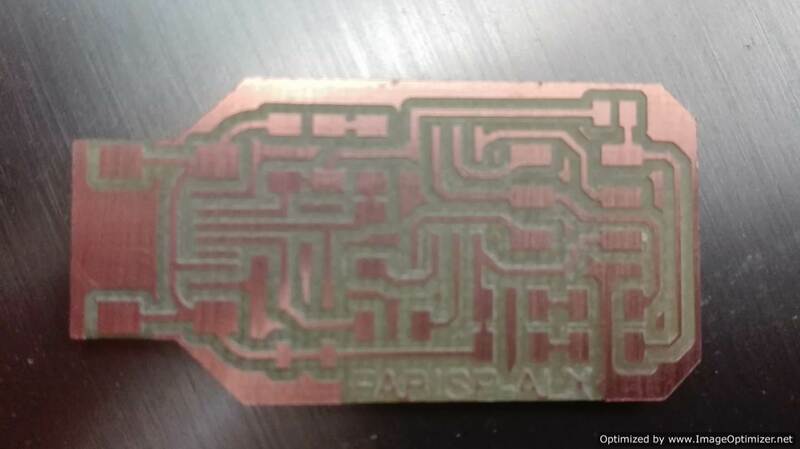 We decided to make some test boards to practice welding. 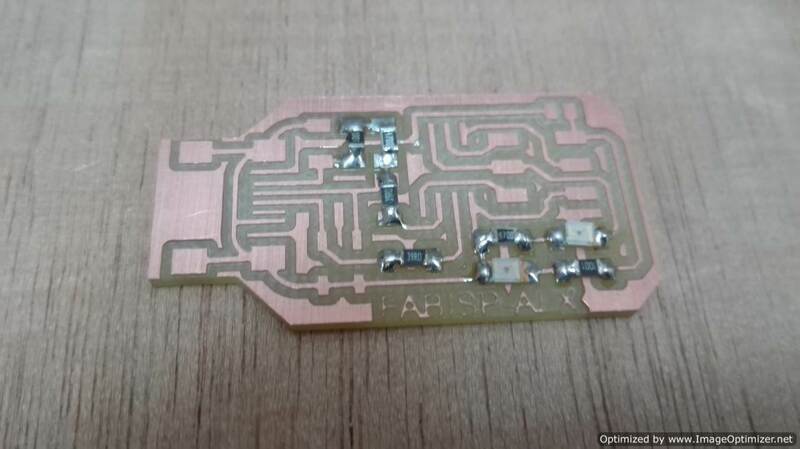 When making the test pcb board, we observe that the bed of the machine is not uniform. 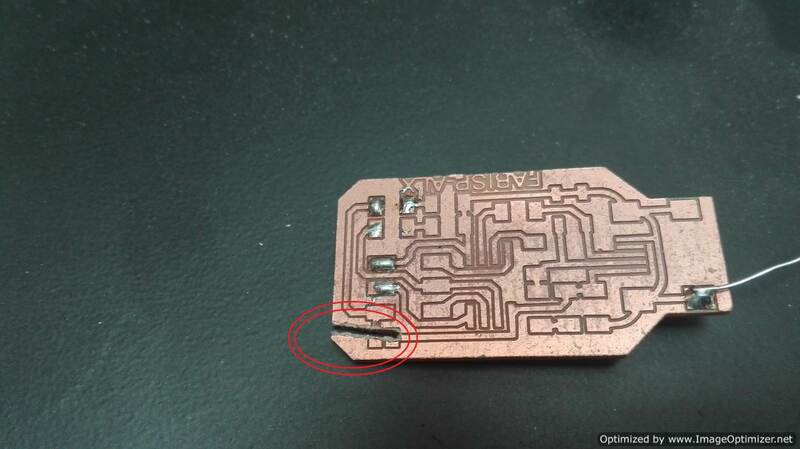 This was a strange problem: a small piece of pcb board was the culprit. 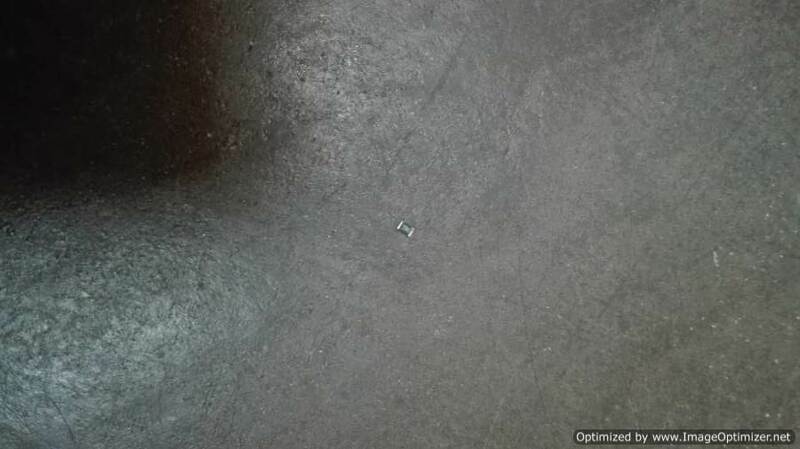 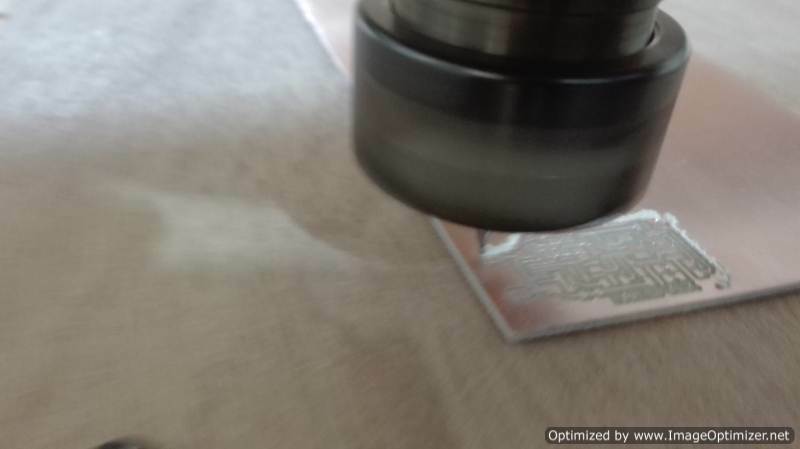 Here we were able to practice the process of generating the routes with the fab modules and milling with the machine. 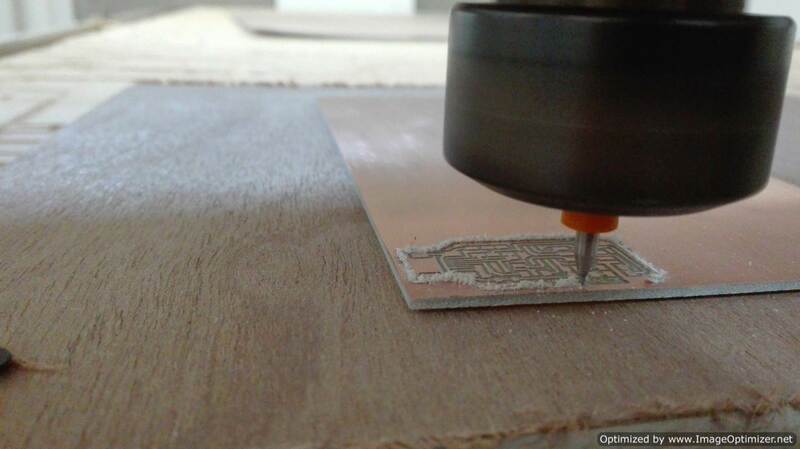 With the pcb test board already made, I made welding tests, so that in the new board everything comes out of the best. 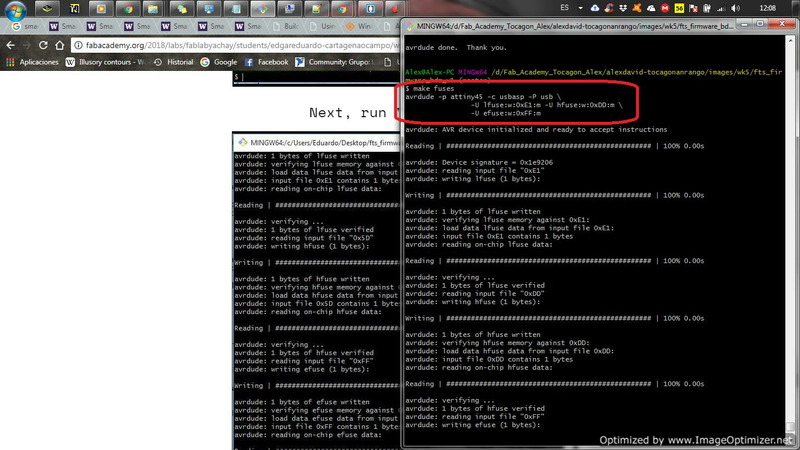 Take the test file but we found a problem, when generating the file in http://fabmodules.org/ and in http://mods.cba.mit.edu/. 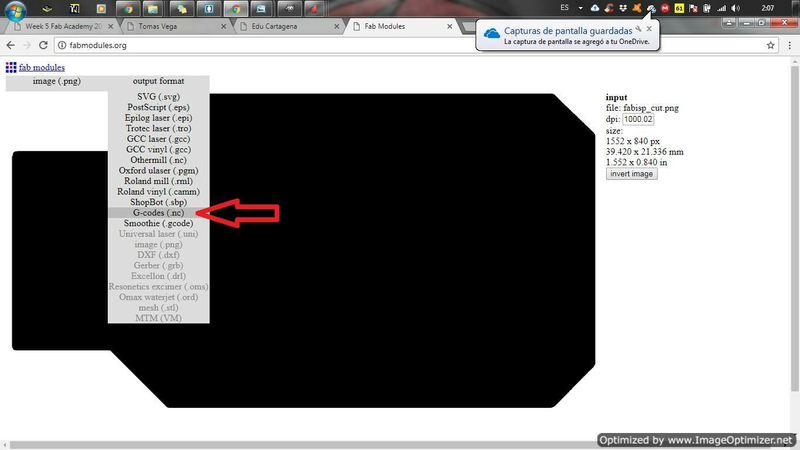 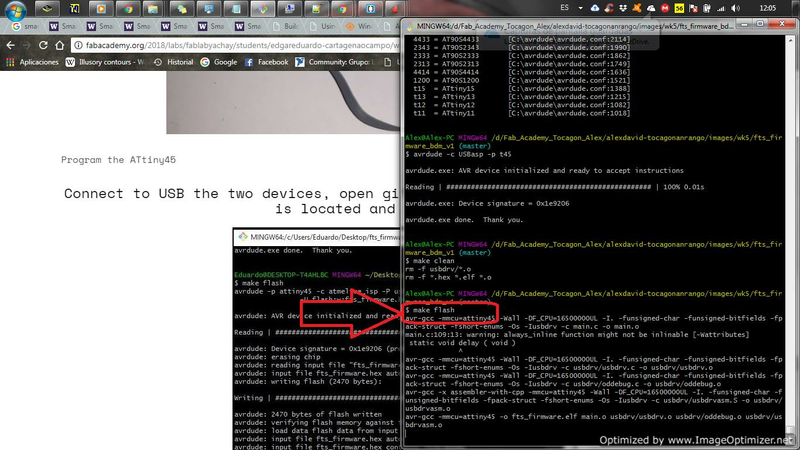 Here I leave the files for analysis, the scrolling speed is very low when generating the file at http://mods.cba.mit.edu/. 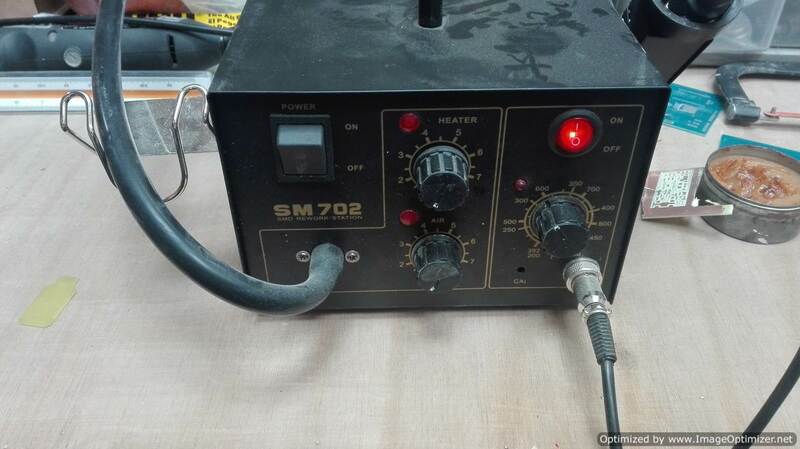 We identify the welding station and the components for a correct welding. 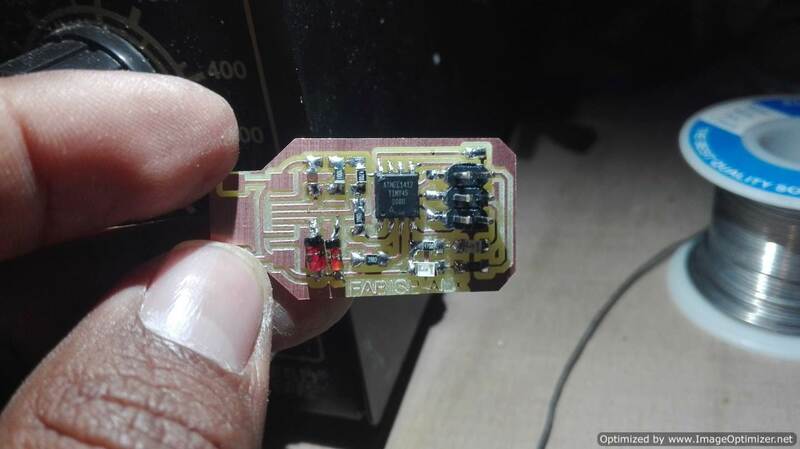 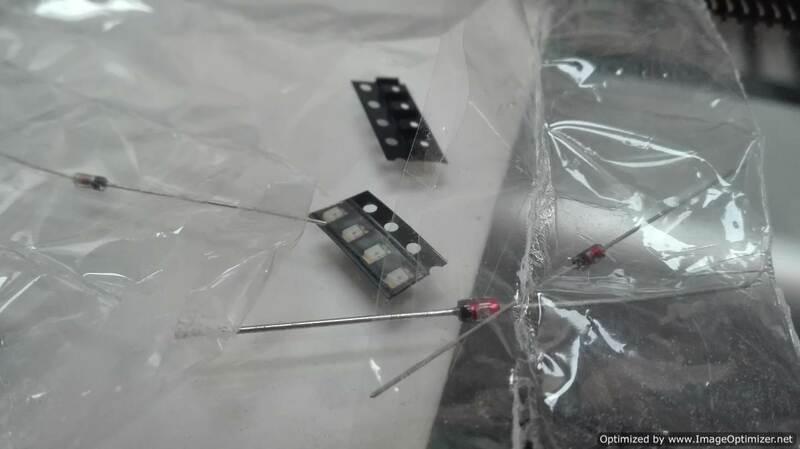 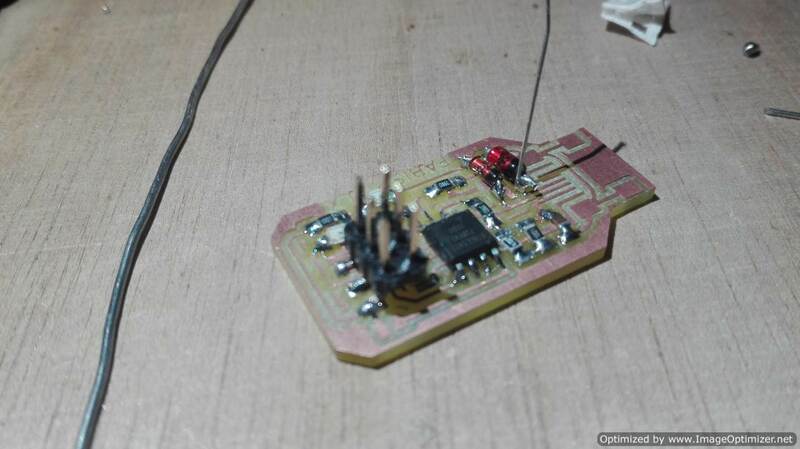 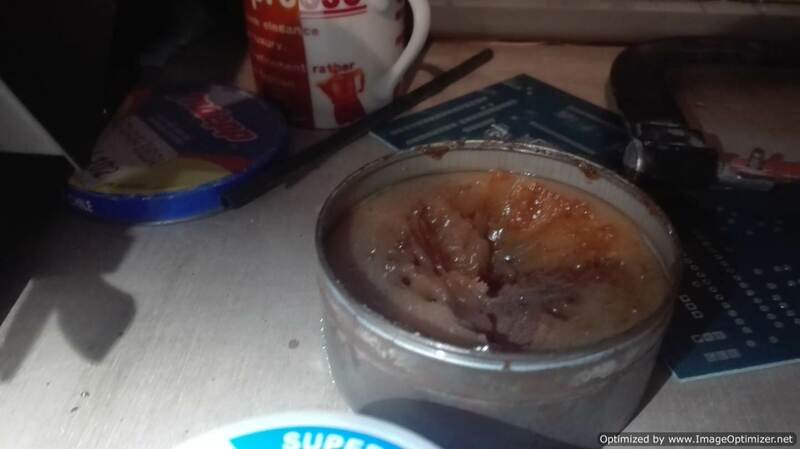 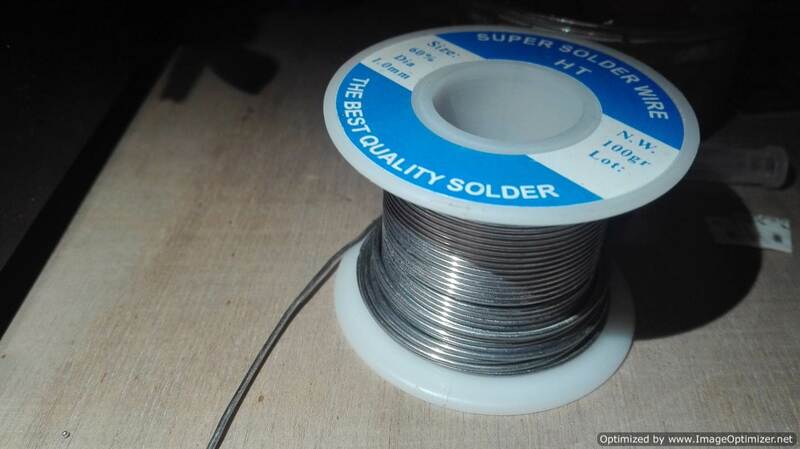 The components are the solder paste, the soldering iron, the solder wire and the heat gun. 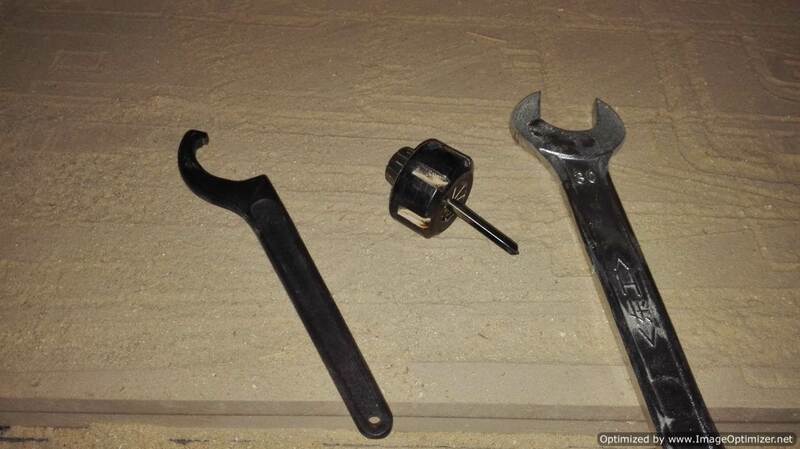 There are more tools for the soldier but the ones I mention are the most necessary. 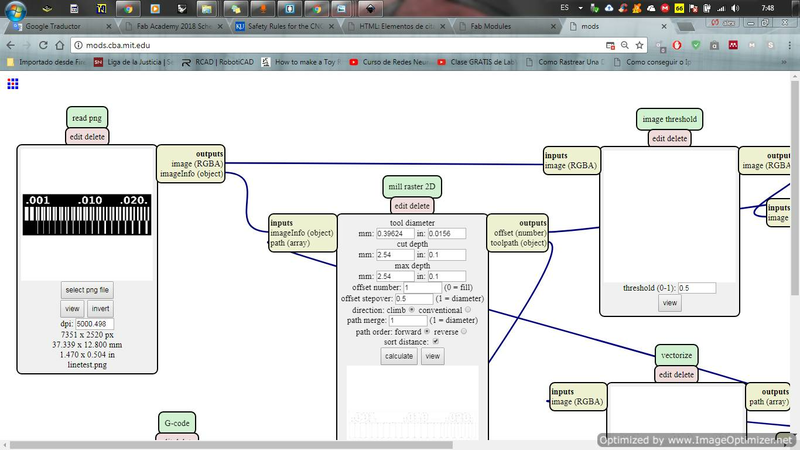 * Optionally, trying other processes. 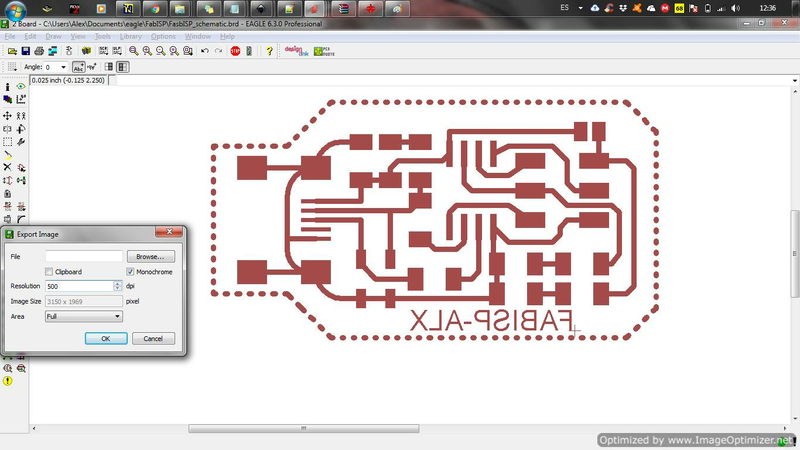 I have experience making pcb boards. 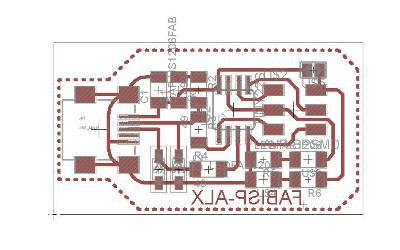 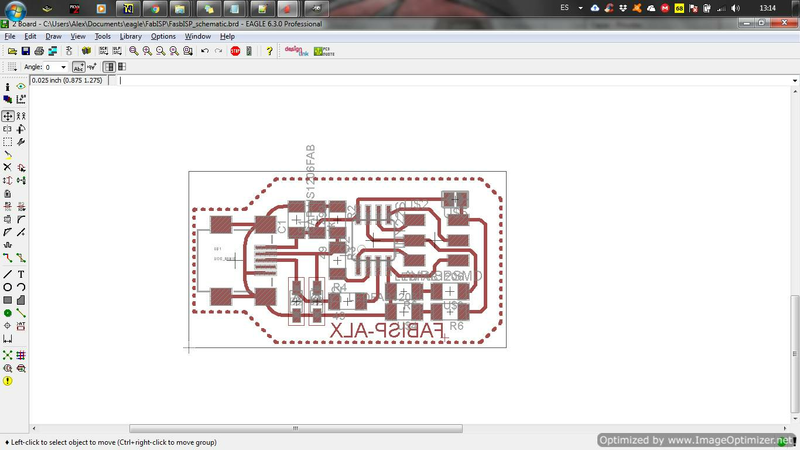 I set myself the challenge of making my own PCB board, look for information on the circuit and I started from there. 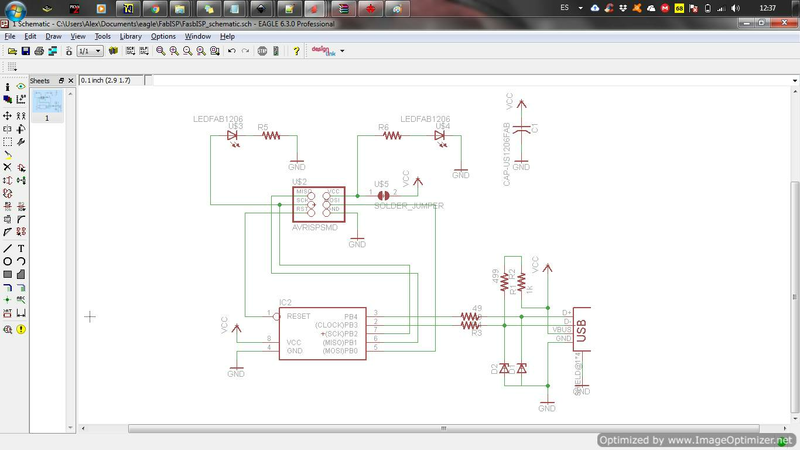 Use the fab library that the instructor gave me.After finishing the schematic, I made a nice design, here it took me a long time to reach my goal. 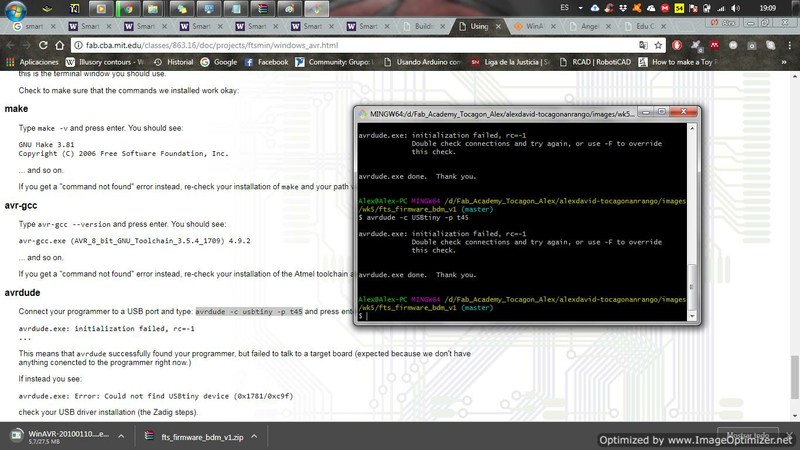 To export the file to the fab modules, you have to do one step before. 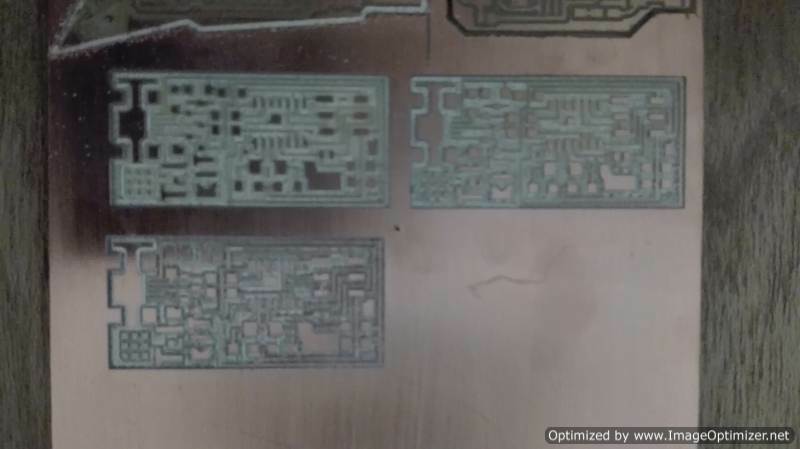 We must first generate the monochromatic image of the pcb board. 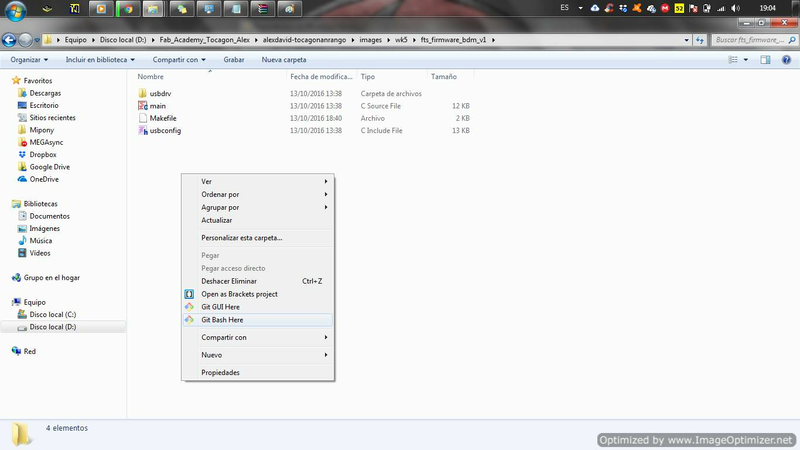 After generating the file, we open it with the Gimp image editor. 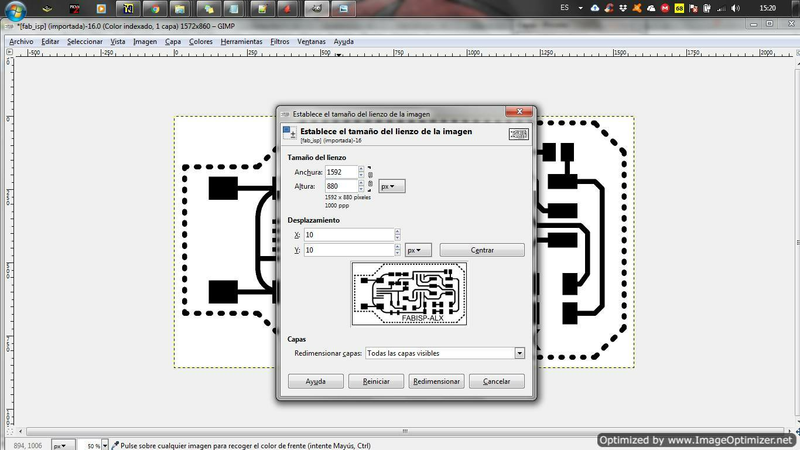 I have to make the following changes: invert the colors, draw a border and generate 2 individual files, one of strokes and one of contour cutting. 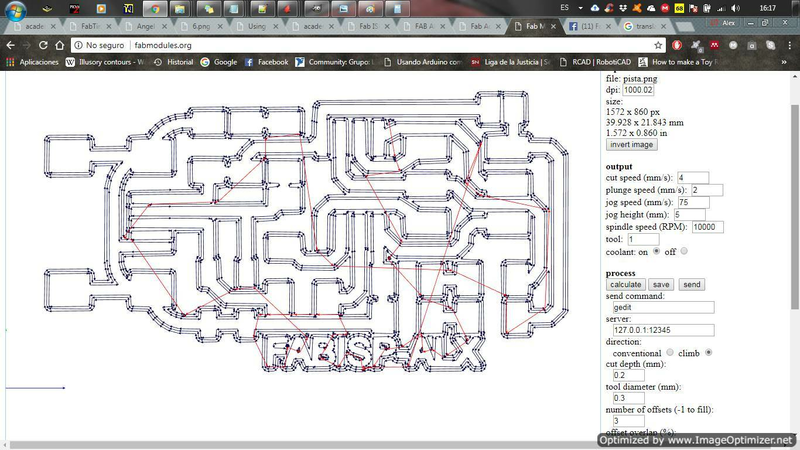 With the files of strokes and cut and ready passed to fab modules to generate my routes. 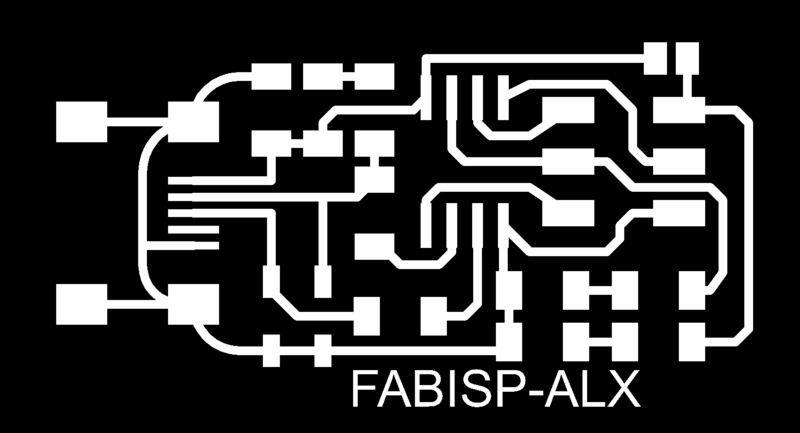 Here I had to do it 2 times since the first time the fails to make an adequate route, these routes are generated by the fabmodules with The default parameters without changing any of the values. 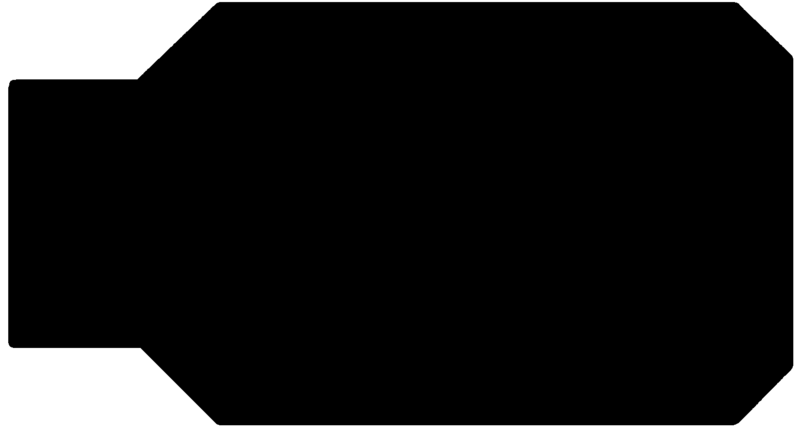 In the second way, I change certain parts where I already obtain more adequate routes and observe that it completes all the contours. 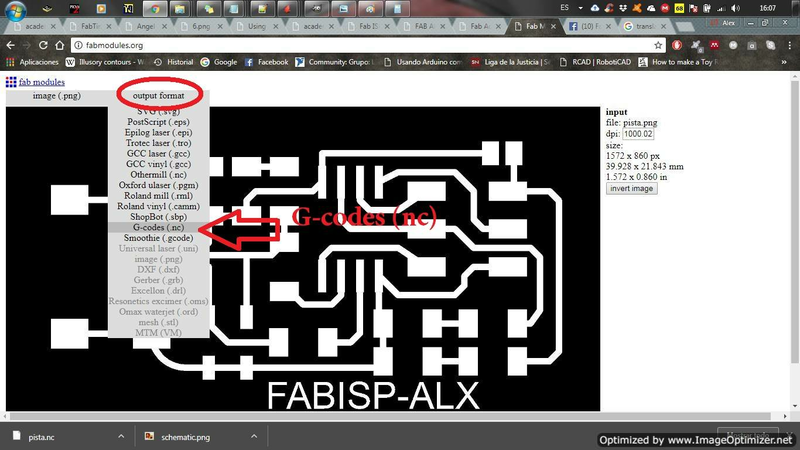 I use the link as a guide to programming the FabISP. 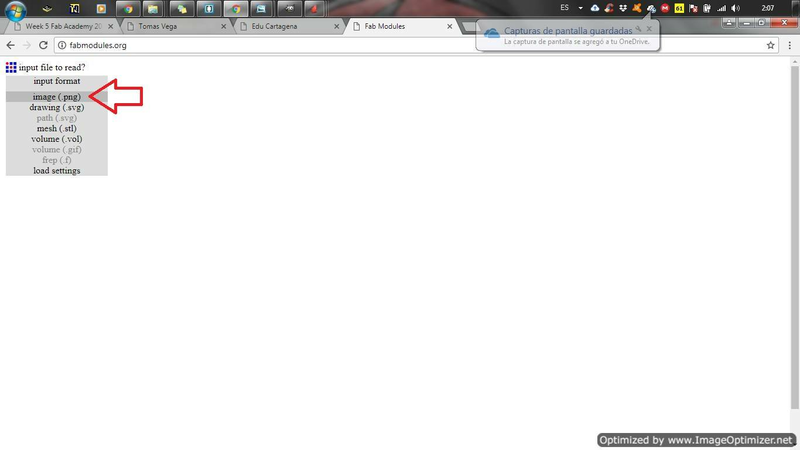 Go to the Start menu and open the Control Panel, then go to System. 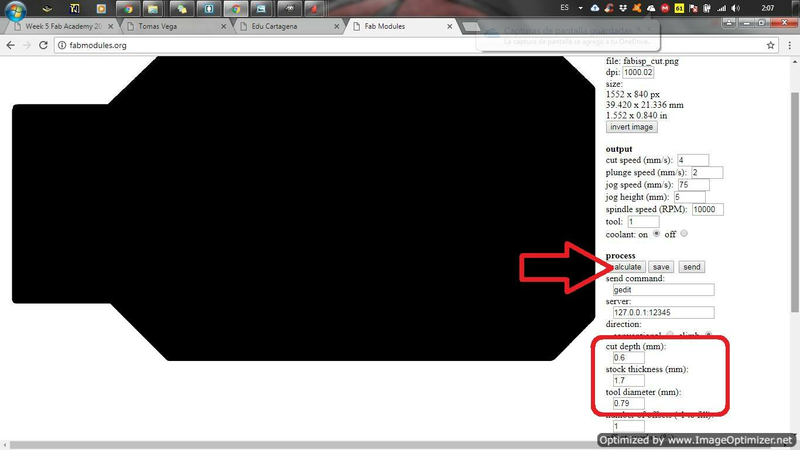 From the left panel, choose "Advanced System Settings". 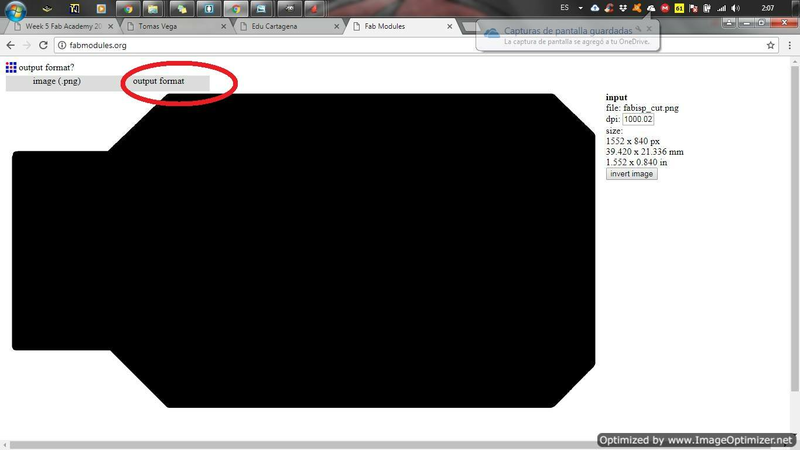 Under the Advanced tab, click the "Environment Variables" button. 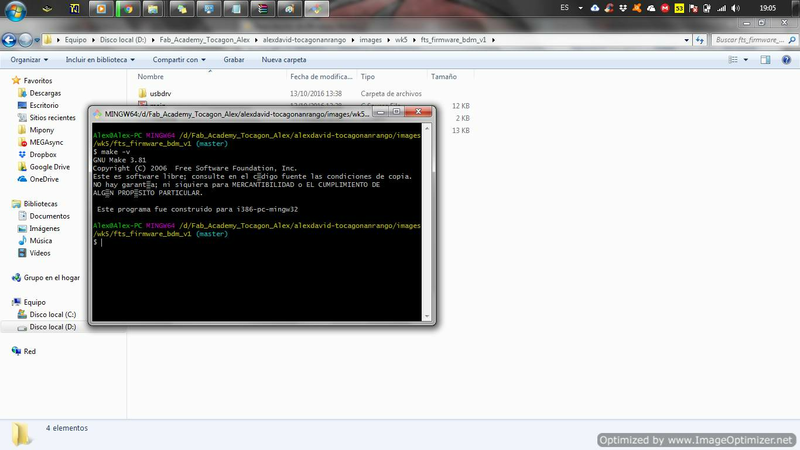 Test the program´s in my computer. 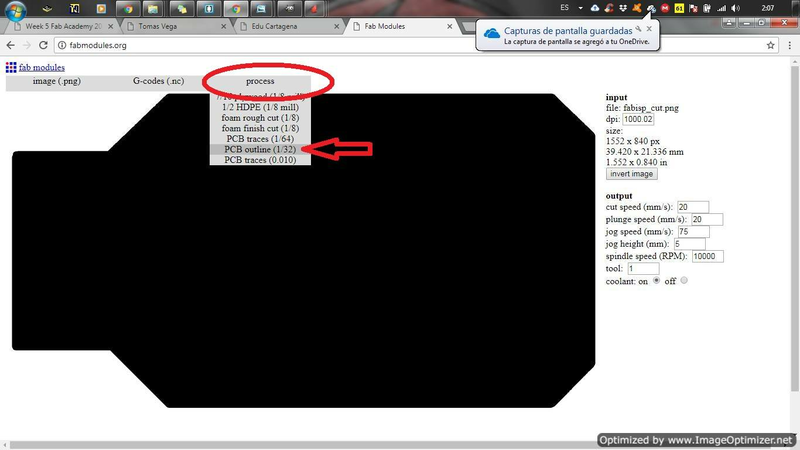 If your answers are similar or equal on the screen, the program is correct. 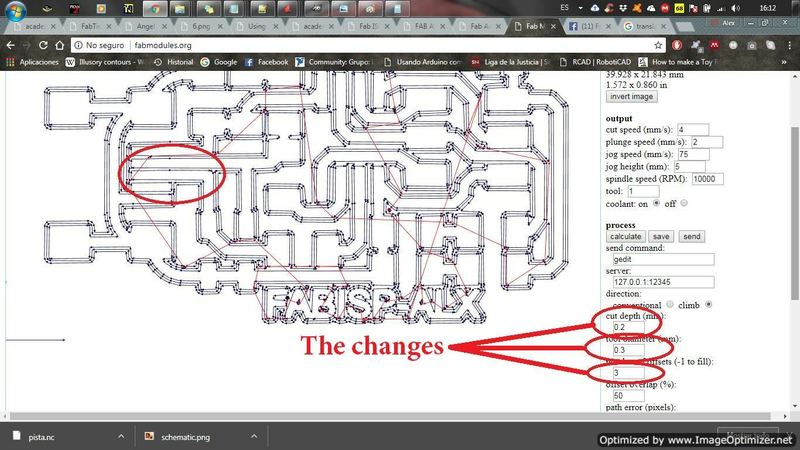 The next steps are to create the files for the FabISP, these steps are very difficult, so pay attention. 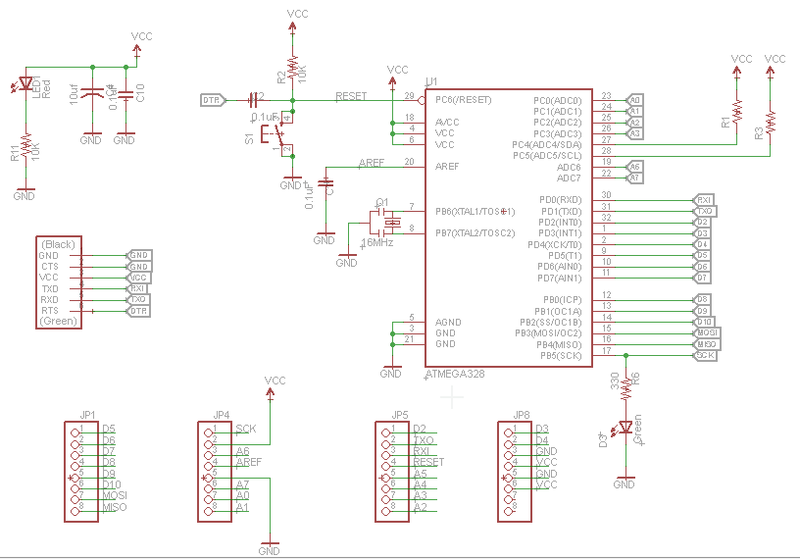 Connect the programmer to a USB and type the make -clean next type avrdude -c usbtiny -p t45 remenber press enter. 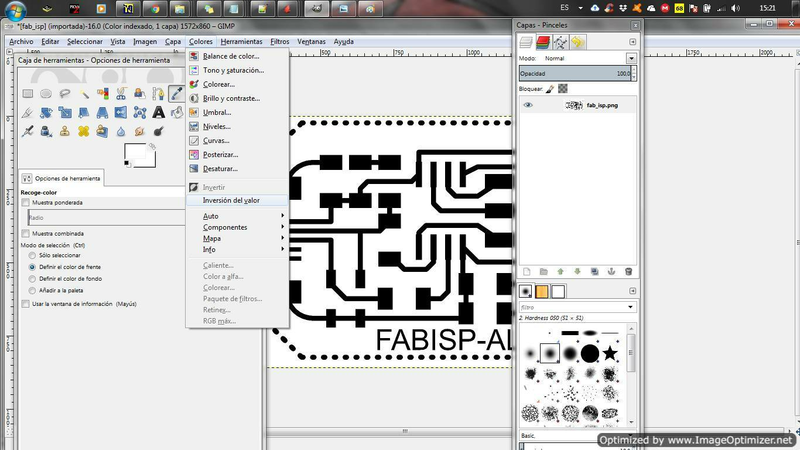 I'm trying to program my fabisp with another programmer with the name USBasp. 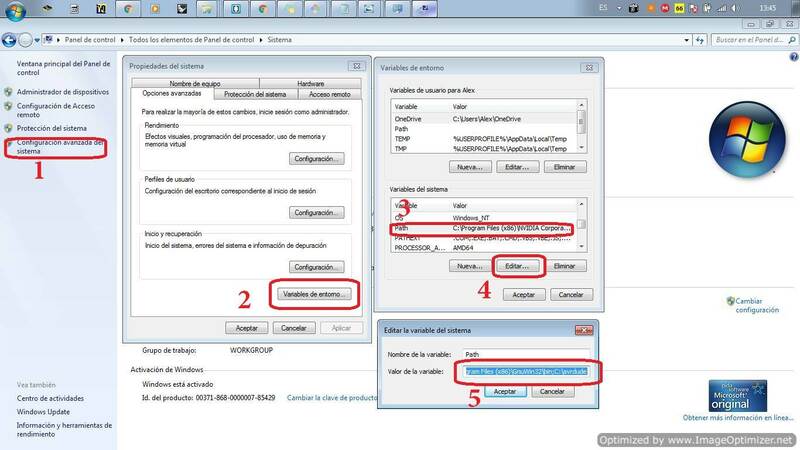 If in the second step see the code initialization failed, rc=-1 this is the solution for windows in my case. 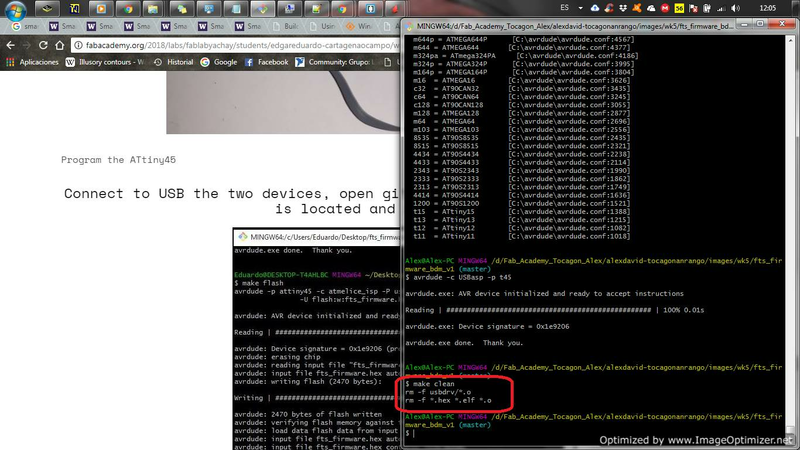 Change the name of the programmer according to the one shown in the equipment manager. 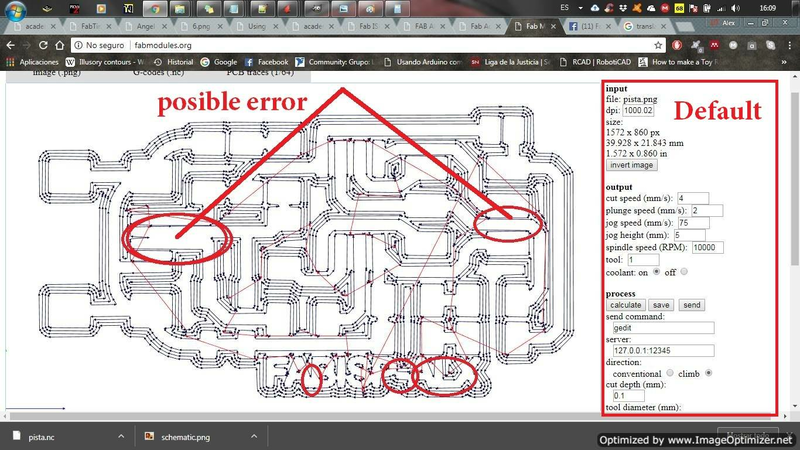 If the error continue , try the next step. 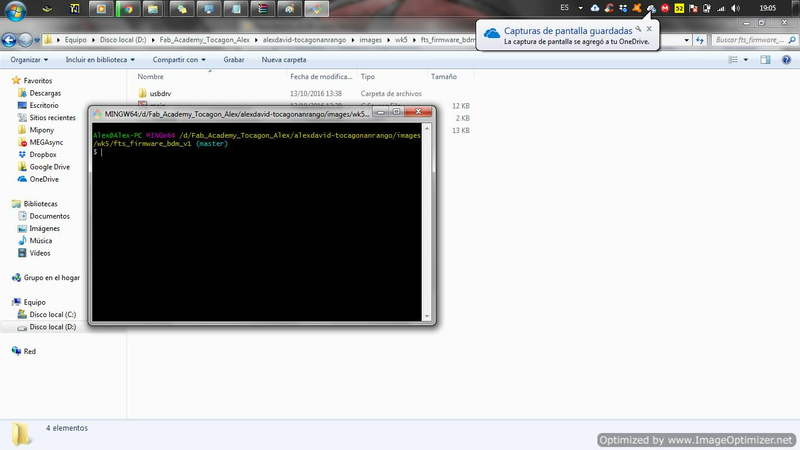 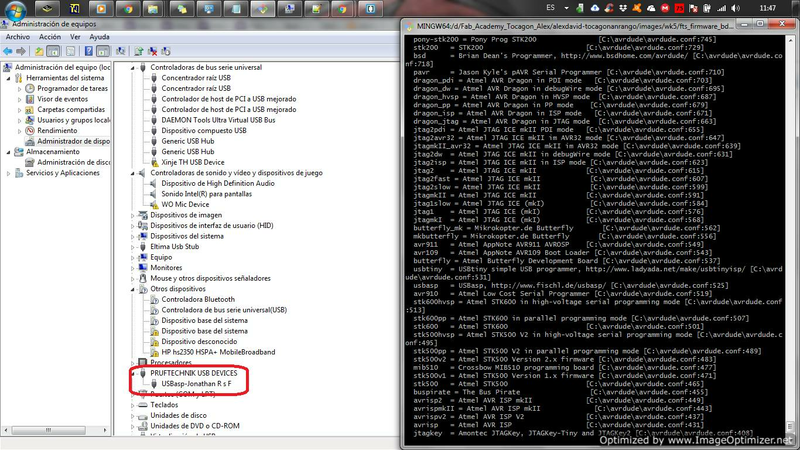 Open de Makefiles and change the name in this files. 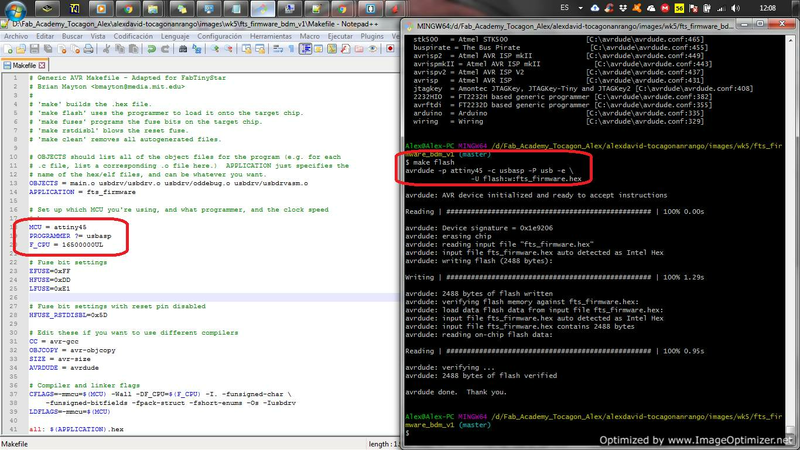 Type the code make flash . 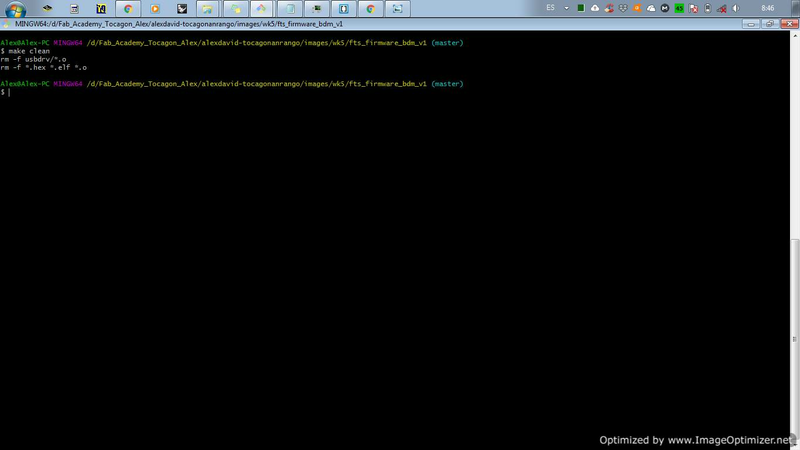 Remember edit the makefile . 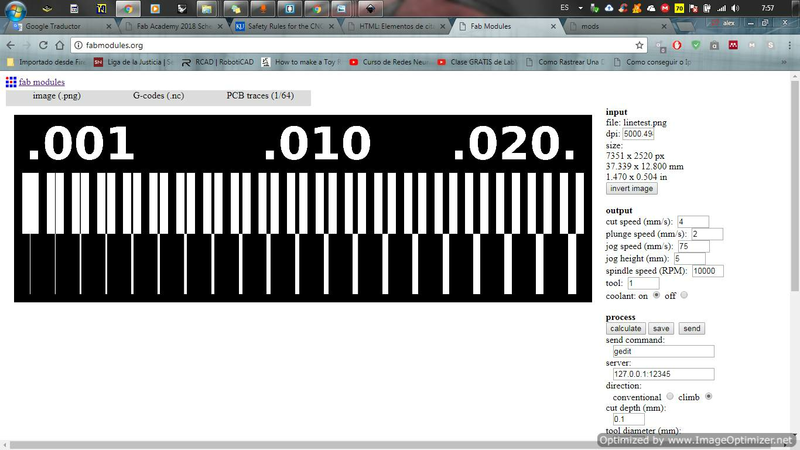 Type the code make fuses . 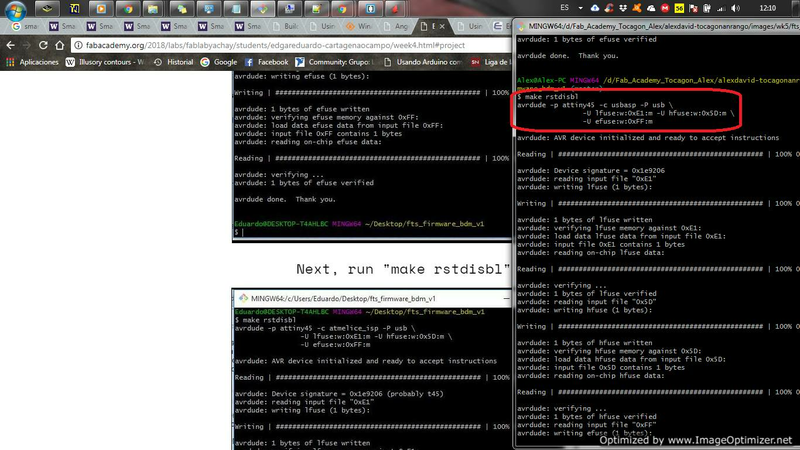 And finally type make rstdisbl . 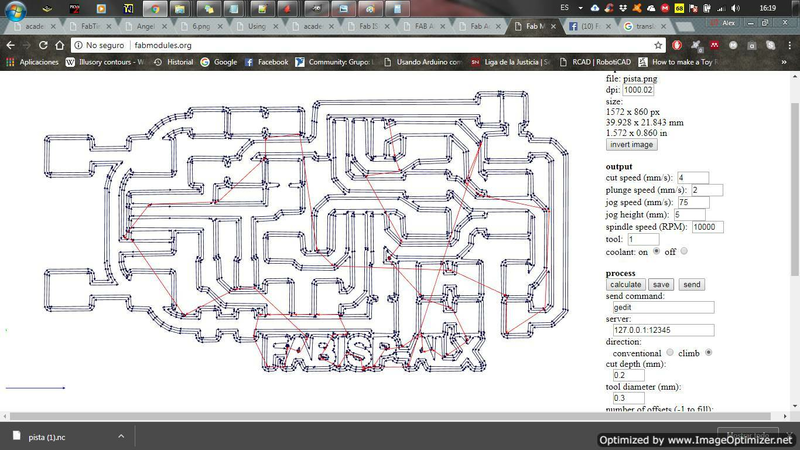 Now I have my Fabisp. 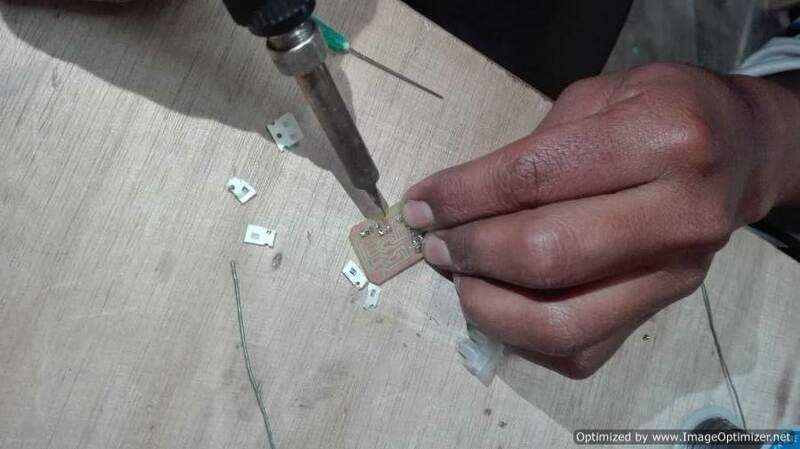 A large machine can make very small circuits all depend on the accuracy of the equipment in our case is great the machine is very useful to capture its large size. 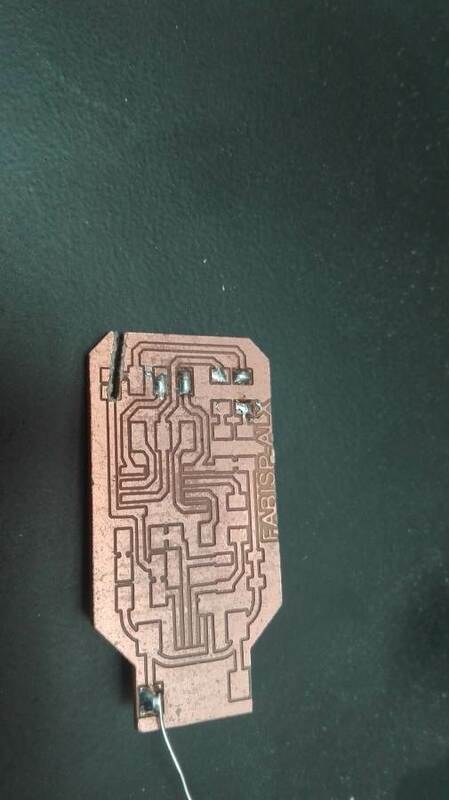 The pcb board that neil asked us to do the test showed us 2 very important things something strange happened with the mods, the drilling speed in z is very slow, another conclusion we saw in our machine, because this is too uneven. 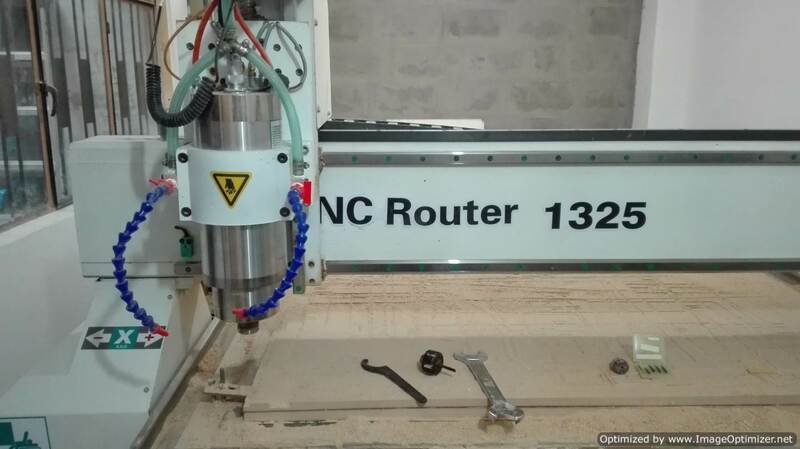 Many cnc correct the level error using auto level programs as in our case we use AUTOLEVELLER. 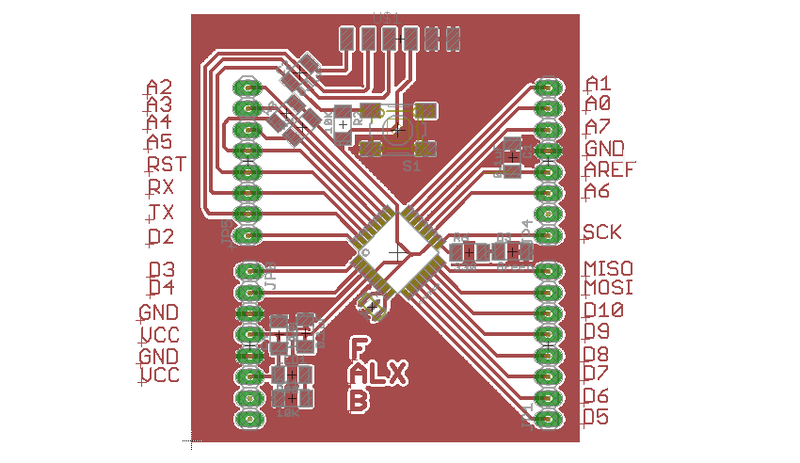 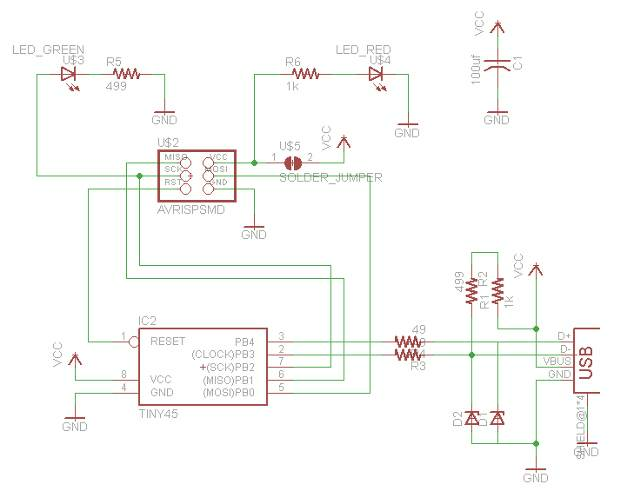 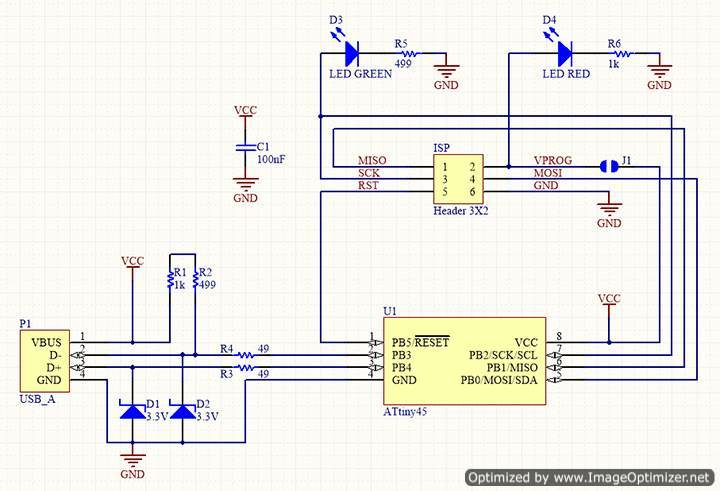 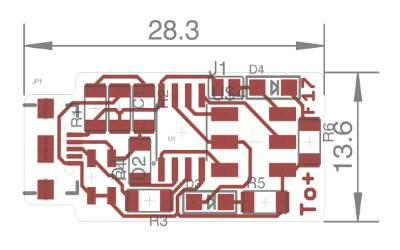 Most circuits are made in eagle a tool that many makers use, I also realized that most students do not upload the original files but upload the photos of the schematics this sometimes delays but it is good to learn how to design. 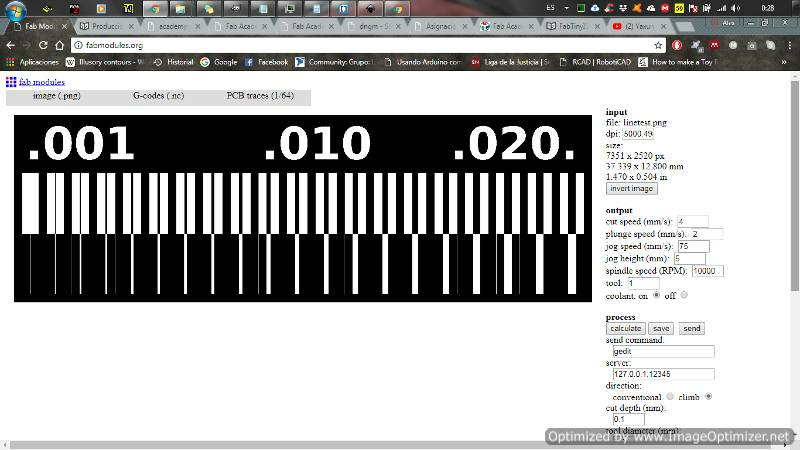 Something very important for me was discovering that you can do a programmer for only about 3 dollars and a very small size, even with this I discovered how to program from the console. 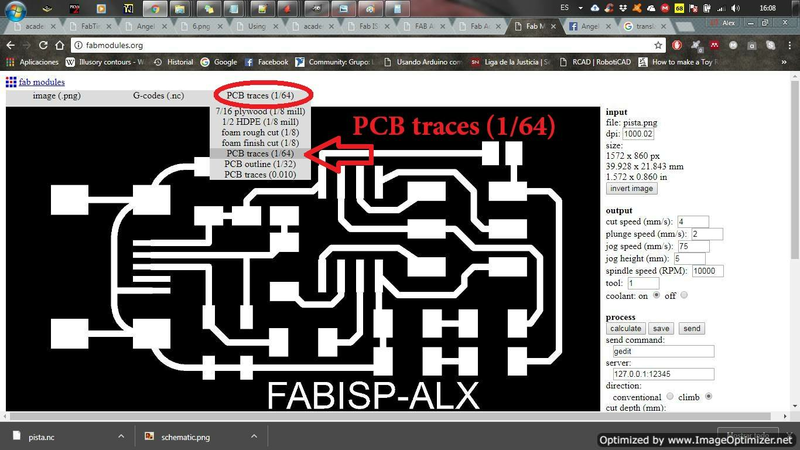 Something that I loved was that Neil liked my PCB silver all my colleagues bother me for that now they tell me ALEX version. 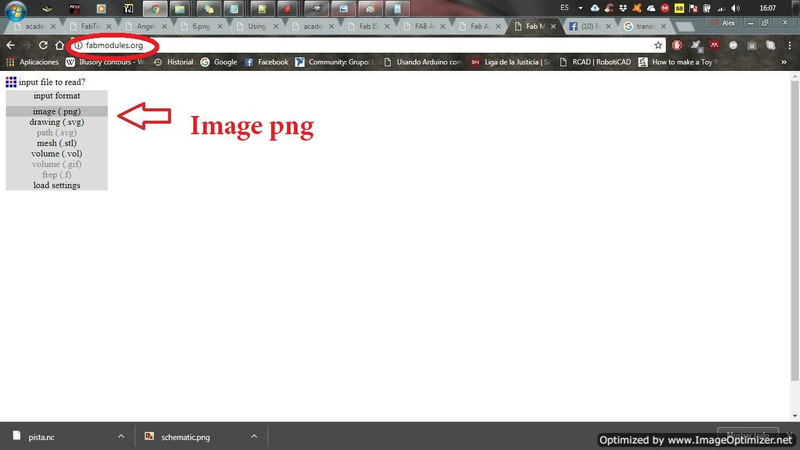 He said that it would be a reference for the prosy academy.